Goodwin Gold: Is there a "best way" to rote learn times tables? Is there a "best way" to rote learn times tables? Most of the results I found weren't very helpful, however one did catch my eye. It promoted teaching and learning times tables in a very structured way, and contained a lot of the ideas that NZ Maths promote as well (See my post on Basic facts). The article promoted teaching the drill in a very specific way, that provided visual, auditory, and kinesthetic cues for the students. However what I really liked was the three step structure. 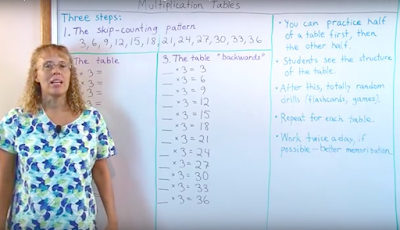 By skip counting with the students first, you are learning to memorise the pattern and answers of the times table set before you begin. This will help the answers spring to mind when you later try to memorise the fact. i.e. 3x1= ?, 3x2=?, 3x3=?, 3x4=? Starting at 3x1 and progressing down the list matches the skip counting and will continue to cement the pattern and answers. Again starting at 1x3=3 and moving down the list. The question is only re-written and shouldn't require as much brain power to answer as step 2, however it does require the learner to think of the question back to front. Again further cementing that fact into the brain. Once finished the three steps you would simply repeat the process, but back to front. i.e. 36, 33, 30 etc. Then continue to do all the steps back to front, and eventually out of order. The article suggests that how long you spend on this drill at one time, and how long you spend on each times table set would totally depend on you and your class. This brings back a lot of memories of learning times tables. It worked for me! The addition I would mention is real world practice - authentic problem solving- at the same time. The rote learning embeds when you use it.